This popular bird was first imported in the early 1990s when the Solomon government allowed exporting some species including the Yellow-bibbed Lory. Before, they were only some pairs available to the Swiss. The prices then were about Eur. 2,500 a pair; today it has dropped to Eur. 550 for a young pair. Today the birds are available in Australia, Europe, New Zealand, North America, and South Africa. Breeding records show that the species breeds like the other Lorius species such as Black-capped Lories and the Chattering Lories. 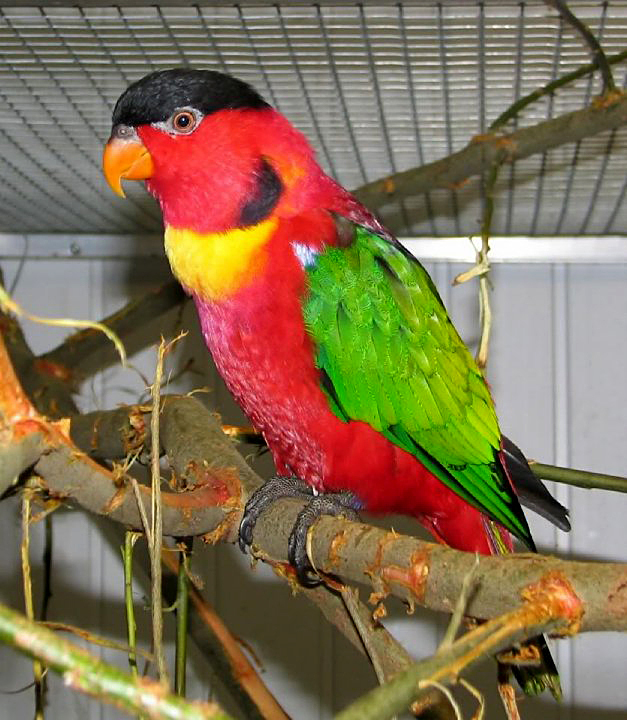 Therefore the Yellow-bibbed Lory will be for sure a new member in our European lory aviaries. The nice colours and soft voice make this species an ideal Lorius species. They don’t have a rowdy character and are still very active birds, which are a joy to watch. This Lorius species is indeed an ideal bird for lory lovers. The Yellow-bibbed Lory is, after the White-naped Lory (Lorius albidinuchus), the smallest Lorius species. Its length is 28 cm, weight about 140-170 g. Adult birds are red and have green wings and on the band of the wing, light blue colour; tail-feathers are green on the end (that is why we call the Yellow bibbed Lory in the Netherlands Green-tailed Lory), a band of yellow on the upper breast, black patches on the side of the neck, a black cap like Black-capped Lories, the thighs are blue-greenish, dark blue under-wings, bill orange, legs grey. Immature Yellow-bibbed Lories have less yellow on the upper breast, the black patches are not sharply marked like in adult birds, and there is less blue on the bands of the wings. The thighs are more green-blue. An older breeder of Yellow bibbed Lories told me that he could see the difference between young males and young females depending on the colour of the thighs. In other words: more blue are males and more green are females. I did not have enough offspring last year to have proof for that, but I must agree it could be true. The other normal marks for young yellow-bibbed lories are black brown bill and eyes. It takes at least 2 years before the youngsters have the same beautiful feathers like their parents have. In Parrots of the World, based on many other works in the past (in this case Novitates Zoologicae VIII, 1901, List of a collection of birds from Guadalcanal Island, in the Solomon group, by W. Rothschild & E. Hartert) it was written that young Yellow bibbed Lories have no black markings on the sides of the neck (Forshaw,J.M. et al,1989). This was wrong and this error was possible because they only checked one young male. This error never would have taken place if more young birds were collected. They were probably taken from a village where young Yellow-bibbed lories are often kept as pet-birds. Pet-birds in captivity on the Solomon Islands are always a little dirty because of their incorrect diet and housing; feathers are often not nice after a while. Rosemary Low in her excellent book Hancock House Encyclopedia of the Lories pointed out about those black markings from young Yellow-bibbed Lories (Low, R., 1998). The Solomon Islands is an archipelago of several hundred islands in the South West Pacific Ocean. The Solomon Islands comprise the six main islands of Choiseul, Guadalcanal, Malaita, New Georgia, San Cristobal and Santa Isabel. Most of the islands are of volcanic origin and have rain forest covered mountain ranges intersected by narrow valleys with coastal belts fringed by coral reefs. Most of the smaller islands are raised coral or low atolls. Most people know that Yellow-bibbed Lories are coming from the Solomon Islands, but often they forget that this species only lives on the eastern part of this group of Islands. Their living area is therefore not more than about 13.400 sq. km. (5200 sq. miles).To make a comparison this area is smaller than a fifth of the island Tasmania from Australia and indeed very small. The main Islands where this beautiful bird lives are: Guadalcanal, Malaita, San Cristobal and “the remote island” Rennell. The Island Ugi, which is mentioned in some bird books is a very small island of some sq. km. Ulawa, Savo, Santa Catalina and Santa Ana also a small Islands where the Yellow-bibbed Lories also can be found. The smaller Islands of the Three Sisters (Malaupaina, Malaulalo and Eliiti) form a chain running northwards from San Cristobal, about twelve miles east of Ugi and here you do not find this bird. Yellow-bibbed lories have the most remote area of all other Lorius species. Most Lorius species live closer together in their area and sometimes together. 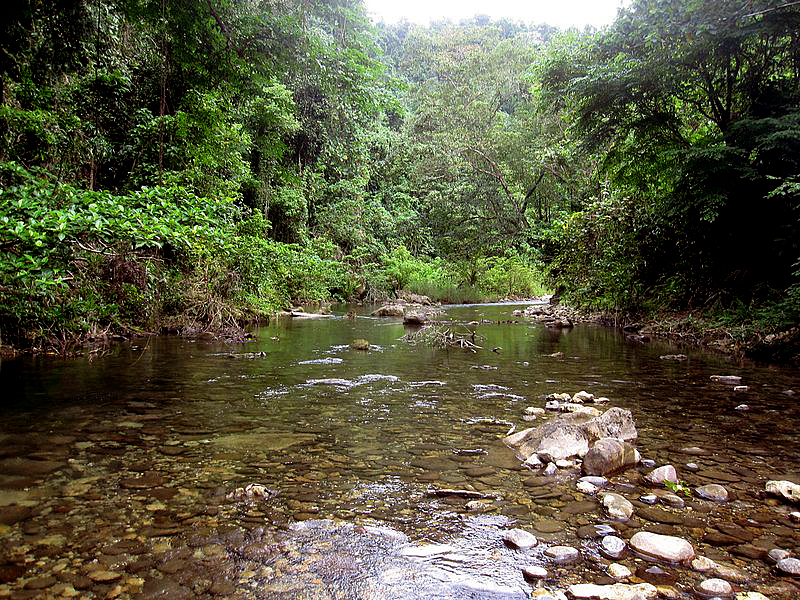 River in Guadalcanal, Solomon Islands. (c) Stefan Krasowski. This file is licensed under the Creative Commons Attribution 2.0 Generic license. There is a gap of Lorius species between the Eastern Islands of the Solomon were Yellow-bibbed Lories come from and New Ireland where the White-naped Lories and Purple-bellied Lories live. No other Lorius species live on the islands between those species and that is little bit strange. This gap is about 600 miles. Other species like Meek’s Lorikeets (Charmosyna meeki), Duchess Lorikeets (Charmosyna margarethae), Cardinal Lories (Chalcopsitta cardinalis), Massena Lorikeets (Trichoglossus h. massena) for example have a much bigger area and live on the same islands than Yellow- bibbed lories. All 4 mentioned birds live on Bougainville Island, which lies in the gap. Why is the range from the Yellow-bibbed not bigger like the other mentioned species and failed it to reach an Island like Bougainville? Another strange thing is that Island Rennell lies more than 100 miles away from the other 3 main islands where Yellow-bibbed Lories live. Birds could be introduced at this place as Yellow bibbed Lory is often kept as cage-birds and occasional escapes may occur on other islands in the Solomons. Young Yellow bibbed Lories cost about S$ 50 – 100 each for local people on the Solomon Islands. This price is low and therefore stimulates pet-keeping. To go further with this subject lays out of the scope this article. Nature surprises us every time again. The Solomon Islands have more hidden secrets. Rennell Island, this young volcanic archipelago in the southwest Pacific has his largest raised coral atoll in the world, 86 km long and over 15 km wide, with an area of 671 sq. km it is the most isolated of the larger islands of the Solomons. As many as 43 percent of Rennell’s breeding birds are endemic. Still new species of endemic orchid are found on small islands in the Lake of Rennell Island. During a recent study the number of known orchid species was raised from 4 to 22 in five days. Every time again they find new flora and fauna. Yellow-bibbed Lories are not special highland or mountain birds as some books tell you. Rennell is a coral atoll and has no mountains. Also Ugi and Ulawa are small islands and have the same height. The mountains of the 3 largest islands are not specificly high. Highest mountain on Guadalcanal Island is Mt. Popomanaseu 2331 m.; on Malaita Island’ 1432 m.; on San Cristobal Island 1280 m. Black’-capped Lories (Lorius lory species) on New Guinea visit occasionally up to a height of 1600 m. The conclusion is that Yellow bibbed Lories live on the same heights as Black’-capped Lories, which is a bird of lowland forests. Idyllic villages on the coast near Auki, the capital of Malaita. Photo taken by Irene Scott for AusAID. This file is licensed under the Creative Commons Attribution 2.0 Generic license. With the possible exception of part of the northern coastal plain of Guadalcanal, which lies in a rain shadow and is regularly burnt, all the Solomon Islands have an extremely high rainfall. There are no true changes of season although there are seasons of greater or lesser rainfall with the greater between November and March and the lesser between April and November. Average annual precipitation is 3,050 mm. 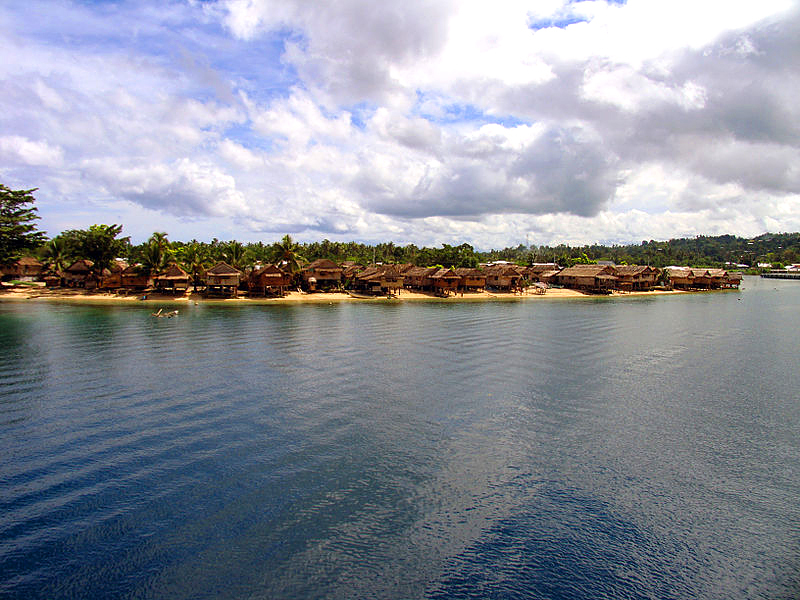 (120 inches) and the average temperature in Honiara is 27 degrees Celsius (81 degrees Fahrenheit) all year. Even today, most of the islands present a picture of dark green densely forested hills and mist-covered mountains. It was this sombre appearance that may have been the origin of the name Melanesia: the dark islands. The forest canopy is 30 to 40 m tall. The only emergents are Terminalia calamansanai and several species of strangling and banyan figs. Climbers and epiphytes are very abundant. Cyclones are the major influence of floristic differentiation, but humans have also had a strong influence on structure. Swidden agriculture (“slash and burn”) is practised throughout the Solomons, although today people mainly live in coastal areas. But Malaita’s forests have been heavily cleared for cultivation. Previously when populations were larger, and distributed inland, larger areas were cultivated and subsequently valuable stands of timber developed when they were abandoned. There are about 60 common large trees, 12 of which are very plentiful and widely distributed. The Solomon Islands have more tropical rain forest than any other western Pacific nation, and it also has a substantial logging industry. The export of hardwood logs provides a third of national export income, but the extent of log gable forest remaining is not large. There is strong pressure from timber interests because few Pacific countries still permit log exports. It is tempting for the customary owners to sell the standing timber in their forests even where the forests are essential to support village life, as on Rennell Island. Much of past logging has excessively damaged the forest and regeneration has been poor. Generally logging operations on their own do not cause deforestation. Where only logs over 55 cm diameter are removed damage is not excessive, but where all logs over 35 cm have been taken (locally called “supers malls”) the forest has been utterly degraded, as is the case in Fiji. Areas that have been the 1960s onwards, developed climber tangles and small pioneer tree cover, and after 25 years it is developing a forest cover. Almost 90 per cent of the forest was considered by FAG to be unproductive of timber because of access problems on the steep ground. A few timber plantations have been established. There is an urgent need to identify and create conservation areas to protect representative samples of the various forest types (Collins, N.M. et al, 1991). This will also help to protect Yellow bibbed Lories and other lory species, which can be threatened by shifting cultivation in the future. READ THE NEXT PART OF THIS ARTICLE ON THE NEXT WEDNESDAY!